How much does it cost to travel to Nakhon Ratchasima? How much money will you need in Nakhon Ratchasima? The average price of food for one day is ฿107 ($3.35). Additional pricing is in the table below. These average travel prices have been collected from other travelers to help you plan your own travel budget. How expensive is Nakhon Ratchasima? How much money do I need for Nakhon Ratchasima? If you're planning on traveling from Bangkok to Isaan, you'll likely make Nakhon Ratchasima your pit stop or home base. However, there is so much more to this sprawling metropolis than just a layover. Underneath the chaos of it all, is a charming and traditional Thai city. One of the most iconic symbols of the city is the Statue of Thao Suranaree. This statue stands in a municipal area, and both night and day you'll be able to see the locals kneeling and praying before making offerings of incense and flowers. If you are going to go up the stairs, take your shoes off first. The Maha Weerawong Museum is a great spot for some quiet, inner reflection. The exhibits are mostly Buddha statues and icons. There are several interesting displays of the chairs used by Thai kings and queens on their visits. 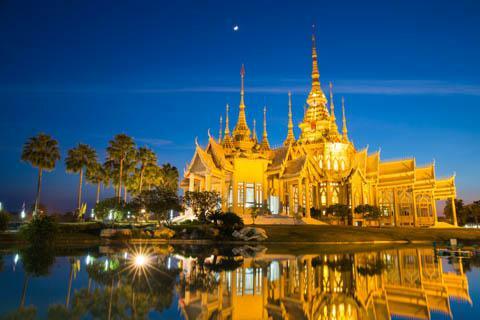 One of the most famous temples in Nakhon Ratchasima is the lake and island temple of Wat Phra Mahart. Walk around inside and see the ancient sandstone statue of the Hindu god Vishnu, or take a stroll outside to see the water lizards lurking in the undergrowth. They may look like crocodiles, but they are generally harmless. Thailand's first national park is the Khao Yai National Park. This vast park of four provinces includes 3,000 species of plants, 200 wild elephants, tigers, gibbons, bears, bats, birds, and more. It's easy to see why this is an attractive spot for animal lovers. If you need a greater guarantee that you'll see the animals you're looking for, take a trip to the Nakhon Ratchasima Zoo. This massive site allows the animals to live in large, natural habitats and many are hand fed. Have your camera ready to see lions, tigers, elephants, bears, giraffes, zebras, chimpanzees, rhinos, wildebeests, antelope and so much more. If you don't want to walk through the whole zoo, there are places to rent bicycles or you can hop on a sight-seeing tour bus for a small fee. If you have more cash to drop, you can hire an electric cart by the hour. Another nice way to leisurely let the time pass by is at the Thao Suranaree Municipal Area. Also known as a park, this pedestrian strip is one of the absolute best places for an evening stroll. Once you pass a short moat section, you are n the walking area. This is where a raised water course follows the once strong city wall. As you continue you'll see the Light and Sound Performance building and more of the reconstructed city wall. There are so many little treasures to see along this route, just take your time and enjoy it. Other activities to look into Nakhon Ratchasima are soccer games at the large Nakhon Ratchasima stadium, the waterslide park and golf, just to name a few. In a sprawling metropolis like Nakhon Ratchasima, there are meals of all types to be found. There are western and Thai restaurants of all prices, but remaining on a budget is simple. The cheaper restaurants usually fall into one of two categories. There are those that sell pre-cooked meals like khao man gai, kwitiyao or khao moo daeng. Then, there are those with fuller menus to pick form. They will usually offer things like khao pad or pad Thai. No matter what, while you're in Thailand you will want to enjoy the local flavors. Be sure to try anything with seafood as it is usually caught locally and fresh. The most popular form of public transit is the songthaews  pickup trucks converted into hop-on buses. You can get on anywhere if you hail it from the side of the road, and usually stops when a passenger hits the buzzer. Each of these vehicles follows a fixed route, and there are approximately 20 different routes covering most of the roads in the city. Since all the destinations are listed in Thai, this system can get confusing. Tuk-tuks are also found all over the city. They are usually found in large numbers where ever tourists gather  shopping centers, department stores, and bus and train stations with individuals sprinkled throughout the city. Taxis are also available, but not as easy to come by.